The Ford Fiesta has been a British favourite for years but it hasn’t always won that accolade by merit. However more recent iterations have been top notch so the latest one has got a lot to live up to. Whereas the styling of the previous Fiesta was bold it appears that Ford has lost its bottle a little, particularly at the back. It isn’t offensive but it could happily wear a Korean badge which is a shame as you could never have mistaken the back in the past for anything else. However there have been some significant steps forward too. Perhaps the biggest improvement is inside where the previous mobile phone inspired dashboard has thankfully been banished for an all together more upmarket and sophisticated design. It looks much better, is made out of better quality materials, and is much easier to use. 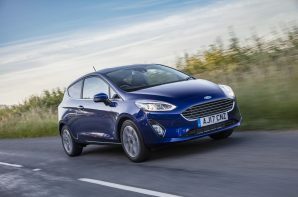 The base model gets a 1.5-litre turbodiesel engine which produces a healthy 84 bhp and a moderate 159 lb ft of torque, which is enough to give the Fiesta sensible performance. Despite this, thanks to low rolling resistance tyres, improved aerodynamics, and the specially tuned engine, the Fiesta emits just 96 g/km of CO2. The great news is that whilst the diesel unit is a stunner when it comes to fuel consumption this isn’t at the expense of driving fun. The Fiesta handles brilliantly, better in fact than many ‘sporty’ cars we could name. For a supermini it’s a triumph. And it doesn’t come at the expense of ride quality either which is also first class. We’re always trying to dismiss the myth that ‘eco’ cars are expensive, slow, impractical and dull. The Ford Fiesta can’t be accused of any of these failings so it gets a big thumbs up from us. But it doesn’t stop there. It’s also very refined and really does pull off the big car feel that many say stops them from downsizing. Not just a great supermini, but a great car.